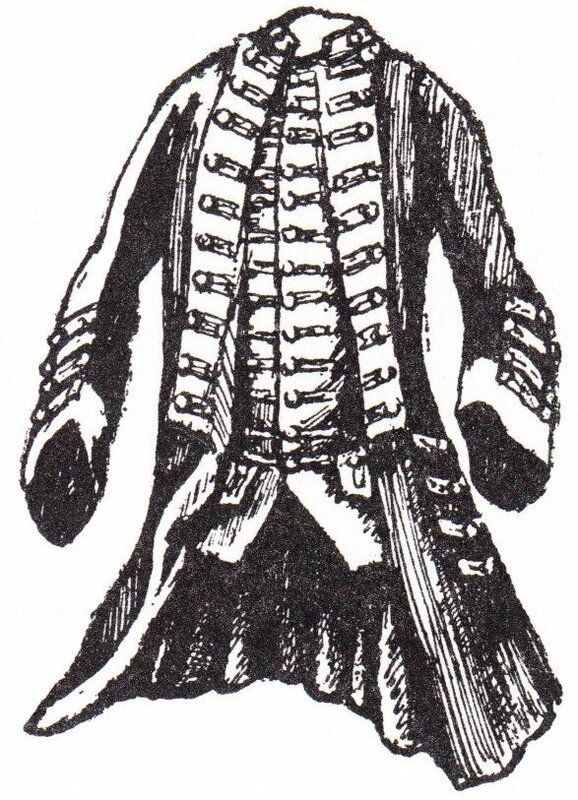 All the more surprising then that a comparable officer’s suit of the East Yorkshire Militia for this period – coat, waistcoat, breeches – lies uncelebrated in the vaults of York Castle Museum. (The coat and waistcoat were sketched by C C P Lawson at Leeds Museum and Art Gallery, where they were once housed, for Volume II of his mega-study, which confirms the id.) The York online catalogue, such as it is, does not identify or group these items, and associates only the waistcoat and breeches. The three accession numbers are from widely different years, and the significance of this uniform may have been lost over the decades. I hope it is now recognised, for this is a remarkable and historically important uniform. 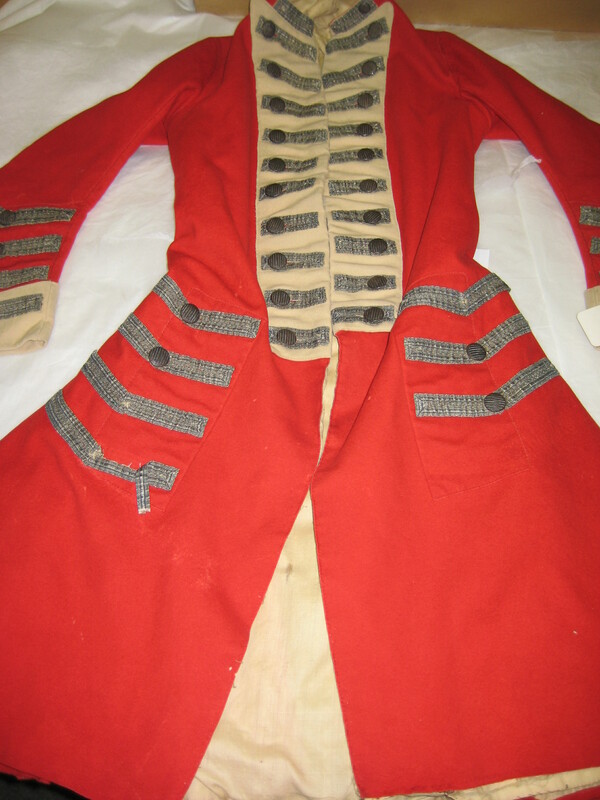 The scarlet coat is lined and faced buff, with ten buttons and silver laces on each lapel, four on each pocket and cuff, and one each side of the collar. The silver buttons are blank, with a striped pattern. Waistcoat and breeches are both buff. 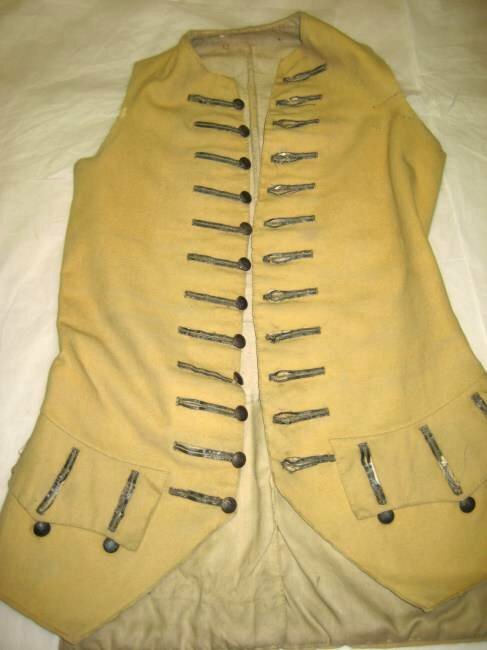 The waistcoat has twelve silver buttons and laces at the front and three on each pocket; the breeches have a tie and four buttons at each knee. The waistcoat lace has not, as the online note suggests, faded from gold; silver lace and buff facings were the constant distinctions of the Beverley Buffs or Yorkshire Buffs, as the regiment was soon dubbed. (In fact a 1790’s silver gorget of the regiment in the National Army Museum is inscribed simply “The Buffs”.) R W S Norfolk, in his East Riding study, asserts that the men of the regiment were issued in 1760 with red coats faced buff with white lace, a white waistcoat and red breeches, but I’m not sure of his source for this; other ranks’ militia uniforms of this period are a bit of a mystery, to say the least. Who’s this? And what’s that hat? When is an Estorff’s not a Lüneburg?